These abstract stained glass panels reflect the artist's past as a geologist. 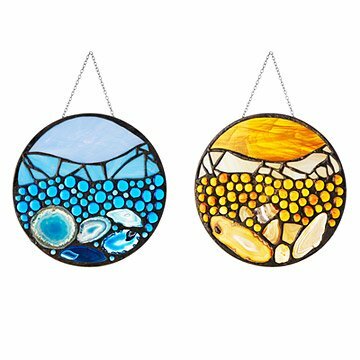 Marshall Craig Miller combines his skills as a stained glass artist with his past work as a geologist to craft abstract panels of organic beauty. He uses glass nuggets and translucent slices of agate to infuse his creative cross sections with the layered look of sedimentary sections of the earth. Marshall uses Art Nouveau master Louis Comfort Tiffany's time-honored technique of copper foil-wrapped glass segments to ensure his compositions are as well crafted as they are eye catching. Handmade in Ohio. Marshall Craig Miller's stained glass has appeared in fine art galleries in the Midwest and Pennsylvania. His father operated an anthracite coal delivery business that sparked his early interest in geology. Later, he developed a curiosity about stained glass while working as a professional geologist in West Virginia and began working in that medium as a hobby. In his abstract compositions, Marshall frequently utilizes agates and glass nuggets to represent geologic layers, as their color and intricate banding complement the stained glass. He exclusively uses the stained glass construction technique popularized by Louis Comfort Tiffany at the turn of the century, individually wrapping each glass piece with copper foil to serve as anchoring points for the solder. Clean with damp cloth, then use a high performance cleaning wax or stained glass finishing compound.